With the summer coming to a slow, hot close, the ubiquitous obsession with six-pack abs and obtaining the perfect beach body should logically wane. Who needs to have the best beach body when it is hidden under thick wool sweaters and bulky down jackets? However, the likelihood is that, even as the air becomes crisp, and as the leaves catch fire and fall to the earth, many Americans will remain tremendously conscious of their bodies, how much those bodies weigh, what those bodies can do, how those bodies feel, and most importantly how those bodies look. Awareness of personal anatomical aesthetics, while not a uniquely American phenomenon, is part of the American mode of thought. This can be demonstrated in a myriad of ways, ranging from the growing concern over obesity (which is likely about more than mere disease prevention), the increase in demand for healthy food options in schools and in the marketplace, the confusing yet abundant diet prescriptions available to people dissatisfied with their bodies, and finally, the physical fitness culture that shows up in the form of gyms, yoga studios, spinning studios, Pilates classes, and digital exercise media. Jonathan Black, author of Making the American Body: The Remarkable Saga of the Men and Women Whose Feats, Feuds, and Passions Shapes Fitness History, takes a long look at the history and the culture of health and fitness in the United States beginning at the turn-of-the twentieth century. Black writes in a style that toes the line between academic and popular, oftentimes falling into a popular mode of writing. A journalist by trade and contributor to the New York Times, GQ, and Forbes, his prose is highly readable, making the 194 pages of the book easy to turn.1 Despite his journalistic background, he cites quite a few well known historians of physical culture rather frequently, including scholars of sport and physical culture Jan Todd and John Fair of the University of Texas at Austin. By including the accounts of established historians of physical culture, Black beefs up the credibility of his work, and at no point does this history of the American body feel “flimsy” or unreliable. Black takes a very broad view of the history of physical culture in a relatively small amount of pages, a daunting task if you consult anyone with even a rudimentary knowledge of the area. Ultimately, his argument seems to be that the work of health innovation has already been accomplished, leaving current and future exercisers to figure out how best to use the physical culture tools and practices around them to create healthy lives. The book is short and dense, as a result of the time frame that Black covers in his account. Before diving into the history, though, Black includes a preface, in which he says of the physical culture pioneers he plans to discuss: “their feats and stories fit no single narrative,” and that, “the end result of this history, it is fair to argue, has failed to fulfill its promise” (p. x). Black sounds defeated before he begins, making the reader question his/her own desire to read a history that the author admits has no ultimate coherence. The preface is then followed by an introduction that is inserted before the unfolding of a primarily chronological history of physical culture in America. The introduction is a detailed description of an important occasion in the history of physical culture, one that all historians of the topic are likely familiar with, and for good reason. In October 1924, the eccentric physical culturist Bernarr Macfadden put on a massively popular show in Madison Square Garden. Black decides to begin his history with an account of this event, detailing the setting, the popular response, and the behind-the-scenes positioning of Macfadden and his well-developed protégée Charles Atlas. This is a much-discussed moment in the history of physical culture in the United States, but Black does not specifically explain why he chose it as his jumping off point. An explanation would have been useful in initially determining his overall argument. After the introduction, Black begins the arduous task of parsing out the many movements within the history of physical culture in the United States. Before focusing on physical culture in the United States specifically, he begins with a quick nine-page-first-chapter that covers the most relevant historical events leading up to the turn of the twentieth century. In that chapter he touches on the Greek’s holistic philosophy on physical education, the subsequent Roman division of mind and body, the importance of Greek revivalism on the growth of physical culture in Britain, Germany, France, and finally the major movements and pioneers of physical culture in the United States during the nineteenth century. The treatment of the aforementioned physical culture movements is quick, but nicely orients the book before approaching the chaos of the uniquely American physical culture and the bodies it helped to shape. There is not enough space in this review to mention all that Black included in his account because it covers so much historical ground, and this in the end, is a strength of Making the American Body. Black mentions all of the key pioneers and the practices that they promoted. The book was published in 2013, which gave Black the space to reflect on a wide array of figures along with the waxing and waning of the fitness trends those figures helped to spread. Most of the founding parents of physical culture, such as Eugen Sandow, Bernarr Macfadden, Jack LaLanne, Bob Hoffman, and Bonnie Pruden, take center stage for Black’s account of the early twentieth century. Most of the book, though, is dedicated to the veritable potpourri of people and practices that emerged in the second half of this era. Black gives a thorough treatment to the modern influences on the shape of the American body. Characters such as Richard Simmons, Jane Fonda, Tony Horton, and Arnold Schwarzenegger all make an appearance, the significance of their accomplishments clearly and convincingly described. Not only does Black describe the importance of different people, but he also looks into the spread of popular movements like Pilates and Zumba, which seem to be bigger than their respective founders. To compliment his description of the people and practices of American physical culture, Black details the spaces in which physical culture took hold. Making the American Body includes an intertwined history of the gym, the tennis club, and the fitness studio. All told, Black provides an all encompassing, sometimes-confusing history of how the American body was forged through fitness, from the turn-of-the twentieth century up the time of his writing. There is no simple solution to combating obesity or the threat of inertial America, but singly and together these developments offer hope that a fitter future awaits. If so, we owe a debt to the men and women who came before – the muscle heads and joggers, the nutritional zealots and barbell salesman, the machine inventors and aerobic divas. The day of the great pioneers may have come to a close, but what they worked for so passionately endures. It is the promise that we can all live longer, richer lives if we learn to attend to our bodies (p. 194). Jonathan Black’s Making the American Body is a slightly useful addition to the more historically rich canon of physical culture tomes like James C. Whorton’s Crusaders for Fitness (1982) and Harvey Green’s Fit for America (1986). It is not as well researched as a book like Shelly McKenzie’s Getting Physical, also published in 2013. Ultimately, Jonathan Black’s Making the American Body is a chronological compilation of relevant facts and figures without an overarching interpretation, which makes it a fantastic starting point for anyone interested in the subject. I recommend it with an understanding of some limitations. If nothing else, reading about the history of American physical culture is always entertaining and often quite shocking. Adam Copeland is a second-year master’s student in the department of Kinesiology at Penn State University, focusing on the history and philosophy of sports. He can be reached at aac5269@psu.edu. Your blog post stems an interesting view on the American body and the way history has shaped those ideas. The book Making the American Body: The Remarkable Saga of the Men and Women Whose Feats, Feuds, and Passions Shapes Fitness History seems, through your description, to be an interesting read. Through your read of the book were there parts that you thought shaped our ideas and body image issues more so than anything else? I wonder this because we often refer to the Greek body and how this is an ideal image for what we should look like. I wonder if this were different how would things have changed the way we see body image? According to Amazon.com, Black’s portrayal of the American fitness craze “reveals how a focus on fitness has shaped not only our physiques but also, and more profoundly, American ideas of what “fitness” is.” However at the end of your review you state that “Black’s Making the American Body is a slightly useful addition to the more historically rich canon of physical culture tomes like James C. Whorton’s Crusaders for Fitness (1982) and Harvey Green’s Fit for America (1986). “ As I am unfamiliar with these two works, could you please elaborate as to why you believe Black’s account of the history of physical culture is merely a “slightly useful addition”? I found your review to be extremely helpful in making a decision regarding this work. I found that the brevity of the book in conjunction with the large timeline the author chose to tackle made the reading a bit tedious. While the author has an easy to read style as you stated, probably owing to his experience as a journalist, the text reads more like a recitation of facts than a narrative and in the end makes it as enjoyable as reading a world almanac. There is plenty of useful information if a reader wants a brief overview of the subject but I felt that it was all too brief and the author could have written something that was more enjoyable to read had he focused the book on a smaller timeline or at the very least introduced a thread that tied all of these names, dates, and facts together. Do you feel that the author perhaps doesn’t have as keen an interest in the topic as some of the other authors that you mentioned in your review or that these issues are simply weaknesses in the authors writing? Based on your interpretation of the book, “Making the American Body: The Remarkable Saga of the Men and Women Whose Feats, Feuds, and Passions Shaped Fitness History” it seems like it was an interesting read. However, your interpretation leads me to believe that this book is more of a chronological list of events rather than an interpretation of those events. At the end of your review you stated, “Ultimately, Jonathan Black’s Making the American Body is a chronological compilation of relevant facts and figures without an overarching interpretation.” Would you have liked to see more of an interpretation and an opinion from the author? Based off of the book alone, what do you think that authors opinions would have been on certain events and issues? I enjoyed your review, and I have a follow-up question. I am very interested in the social implications of fitness culture, and what certain trends say about our society, through a historical context. For instance, current fitness trends like “Crossfit” and events like the “Tough Mudder” seem to show a movement away from the body-builder, muscle definition, and individual focused mentality that came out of Gold’s Gym in the Venice Beach era, and towards more team-based and “practical” exercise. I think it is possible that trends have wider implications. Does Black address that in his work? Do you think that the ways people choose to exercise can tell us something about their values, desires, and social norms? With your review of “Making the American Body: The Remarkable Saga of the Men and Women Whose Feats, Feuds, and Passions Shaped Fitness History,” this book seems like a great read for just about anyone. You say that is feels like a “mistake” that Black decides not to discuss a potential origin of the physical culture of America. Do you think that Black would have gained anything from taking the approach of finding and describing this origin? From reading your review, it seems to me that Black was only interested in giving facts and examples of why American physical culture is the way it is rather than spending more time describing its origins. 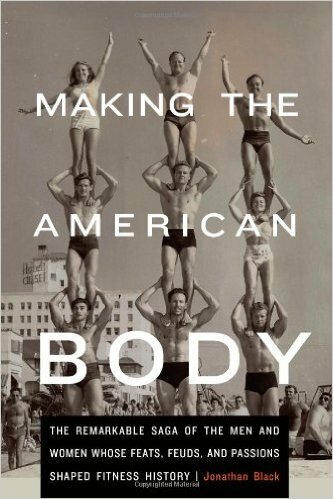 The book review “Making the American Body: The Remarkable Saga of the Men and Women Whose Feats, Feuds, and Passions Shaped Fitness History” has taught be much more than I had ever known about how fitness has shaped Americans. I thoroughly enjoyed how the book captured historians and their accomplishments through a timeline. By doing research on the suggested names that Black wrote about I now have a better understanding on how fitness has evolved from then to now. Do you think that the way people exercise can determine what kind of person they are? Do you think body image is becoming more of a bigger issue? In the book review of “Making the American Body: The Remarkable Saga of the Men and Women Whose Feats, Feuds, and Passions Shaped Fitness History”, I thought Black brought out a topic that most people aren’t to comfortable talking about especially when it comes to their figure. People do come from all different backgrounds and Black talks about that and how also, they talk about people like Arnold Schwarzenegger and how they have goals to look a certain way. What I saw with that is how he basically argues that people with fit bodies and who are willing to work on their bodies, are more determined because they set goals. I don’t see a lot of “Arnold Schwarzeneggers” walking around, so does that mean those people aren’t as determined as he? This is a great review on the book “Making the American Body: The Remarkable Saga of the Men and Women Whose Feats, Feuds, and Passions Shapes Fitness History.” As a college freshman hockey player, I personally am intrigued by fitness and the other elements you discussed in your review. As an avid social media user, I also notice how other people are affected in this generation by the idea of body imagery. Fitness has become a revolution and there seems to be a lot of people taking their part. One thing that surprised me is how Jonathan Black said that the history of physical culture failed to fulfill its promise. I personally think quite the opposite from my perspective of how indulged people are with exercise and health; I wonder if you think the same? The beginning of this book review really grabbed my attention when I began reading the review. The review seemed a little harsh at times but it seemed knowledgeable and seemed to make sense. The human body traces back to decades ago and this article let us know that through what the book provided and even though Black may of wrote a certain way writing this book, I also feel as if the book seemed to of provided a lot of information of what it contained. I feel like the review is very helpful but it also depends on how you think and how you interpret what the reviewer said. Over all I liked the review because it was very descriptive and went into detail of what they were trying to get across to any one reading the review. I found your review very well written. I thought that you showed a good amount of facts and quotes from Black. However as you said, you think Black gave more facts than there were ideas from him an the origin of the topic. I felt the same from your review. I felt like you were talking about the author way more than you were talking about your own feelings so my question to you is how do YOU think the fight against the strive to look a certain way going to end. And do you think America will ever feel like their bodies and look to be “good enough”?